As we strive to inspire hackers and students to build better and faster, we recently sponsored WebHacks, an online hackathon focused on web app development. Judges allocated points based on the websites’ unique design and innovative functionality. We provided $30 of manifold credits to all participants, so they can gear themselves with databases, monitoring and/or logging services. Rather than a gift card or a cash prize, we also awarded a CODE keyboard to 1st place winner Milky (an organize-your-tasks app) because prizes should be cool, useful and encouraging for productivity (even for your next hackathon!). We even had the honour to interview Chan Woo Kim, a member of the two-person winning team, to get an insight on how it’s like to build an app for a hackathon and his team’s experience. What I found interesting was that this was Chan Woo Kim’s first hackathon, and I think his ambition to learn programming is inspiring, as his team made an app that will can motivate others to learn programming, too. Our team comprised of Katie Li, who was in charge of graphic design and designing the look of the entire app, while I was in charge of coding the app based on her designs. We are both high school students who attend an international school in Shanghai, and this was a very interesting experience for the both of us! There is something profound about developing apps that people can use and are helpful to the users with lines of incomprehensible code. I personally feel that it is such a powerful skill to have, being able to develop something when I have an idea in mind. I’ve always wanted to make web applications like Facebook for a long time, and I work very hard every day to one day be able to make such an app myself. Are you and your team currently working on a development team? We are currently working on a web development business called Ornament, through which we will work with clients who want websites for what they may want to showcase on the internet. Our company website is still under development, but it will be deployed to www.ornt.co very soon (right now we have only parked the domain). How often do you participate in hackathon and/or engage in side projects? This is actually the first hackathon we’ve participated in. We are both relatively new to web development. I’ve only started coding websites two months ago and the only other side projects I’ve been doing was making websites for people in need of them. As for hackathons, I’m set to participate in MHacks2017 soon in September and maybe more later on. What made you interested in participating in this hackathon? I didn’t know what hackathons were until very recently. I spent hours scouting for hackathons upon hearing about them, and I felt hopeless seeing that many of these hackathons required me to be older than 18 or was too much of a hassle to fly all the way to the States to participate in. Shanghai really is not the place to look for participating in hackathons. I then found out about WebHacks while searching for hackathons and I was immediately interested by the premise of the hackathon, striving to be the first well-organized online hackathon. It solved all my problems, and it worked out incredibly well. The first page the user encounters in the website goes through a process to gain information for their goals, but the user may just skip this and create a new link just by entering a new one in their browser. What problems are you solving with this app? There surely are apps that allow you to organize tasks and likewise, but I have never encountered them. Even if they do exist, they are solely dedicated to achieving a goal you have in mind. I find that ambitious goals are incredibly hard to get started on just by the thought of such undertakings. It has always helped me, personally, to know what I need to do to achieve what I want to, thereby breaking down the goal into smaller and easier steps that are much less daunting. Many of my friends said that it was so typical of me to code such an app because I’m known to be one of those people who like to set ambitious goals and work day and night to work towards fruition. I use the app myself nowadays to organize my school work and my web development projects. What CLI/tools/services/stack did you use in building this app? I was initially considering the MEAN stack, but I felt that I was far too new to AngularJS to be making an app out of it. We had five days to code this app (we spent two days on ideation), and I could not afford to spend time browsing through Stack Overflow as I struggle with AngularJS. What were your challenges in building this app? I guess the challenge mainly was just that we were both so new to making web applications. This was the first web application I’ve ever built and it has only been 2 months since I’ve started on learning MongoDB, Node.js, and Express.js. Building the front-end was stressful too. I resolved all these problems just by struggling through, spending hours everyday coding this app and gathering help from Stack Overflow. I like to think that everything ended up very well and I’ve improved immensely from this experience. Congratulations to the Milky team! 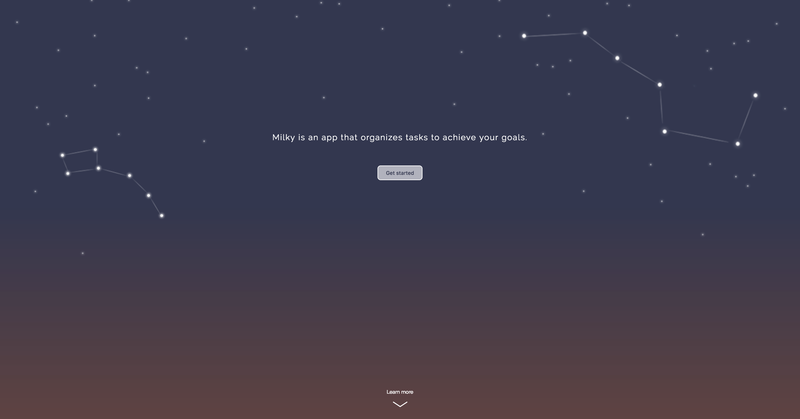 If you haven’t already, you can start organizing your next hackathon project with Milky. How was your first or latest hackathon experience? I’d love to know because I’ll be attending my very first hackathon, Hack the North, in Waterloo from Sept 15–17. If by any chance you’ll be there, come say hi! I’ll be there with our Chief Designer Nick. Feel free to send me a note, or say hi on Twitter! Let’s chat.